Four Americans seek refuge from skin cancer which has become an epidemic in the US. They meet in Canada where one has rented a gothic house close to the Eskimo village which add to the trouble. They fear the earths magnetic poles will trade places and exterminate the human race. They try experiments that simulate a magnetic pole reversal. 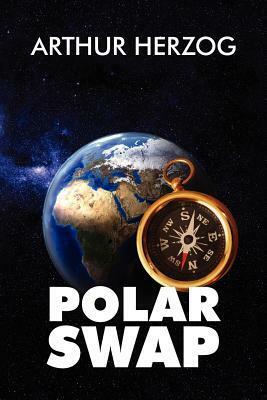 Then the polar swap actually happens. Will these engaging characters survive? For years Arthur studied the earth’s core, that is solid iron but that is surrounded by non solid material which MOVES. As the movement happens, first there are “eddies” in different parts of the earth, then the magnet poles change position, and as that happens the magnetic pull of our atmosphere gets thinner, which allows more damaging sunlight to penetrate, causing more skin cancer. Arthur’s brother Greg Herzog is a professor of Chemistry at Rutgers University, and works on Meteorites, Moon rocks and Mars Dust, and advises NASA on projects. His nephew Christopher Herzog is a professor of String Theory at Stony Brook, and thus discussions among the three were always fascinating, scientific, and material for Arthur’s books.